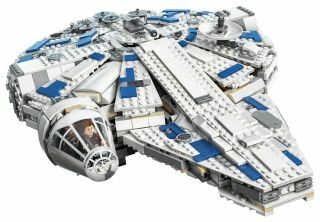 Lego will start selling the "Kessel Run Millennium Falcon" set, a tie-in with the movie "Solo: A Star Wars Story," in April 2018, for $169.99. Lego has created a stunning new version of the Millennium Falcon for the 2018 film "Solo: A Star Wars Story," which details the adventures of a young Han Solo. The 1,414-piece set hits stores in April 2018 ahead of the film. See more photos of the set here! What Millennium Falcon model set would be complete without Han Solo? Han Solo can't fight or fly the Millennium Falcon without his constant companion, Chewie the Wookie. New characters like Qi'ra in the Solo movie helped to energize new sets for the Lego universe. Also included in the set, due to hit shelves in April 2018, is a Lando Calrissian character. Included in the 1,414 piece set is the Kessel droid, which dazzles in red but looks like it's seen many days. The Millennium Falcon model is set with a cockpit ready for space travel. Here, the exterior shell is removed so your Han Solo minifig can gain access. Also, is that a coffee maker in the back? Solo: A Star Wars Story inspired Lego to create this set based on new and beloved characters. The Millennium Falcon is prepared for battle with laser turrets. They're a bit different from the quad turrets seen in Star Wars Episode IV: A New Hope and beyond. This new set from Lego includes details such as laser turrets, a hyperdrive, bunking quarters and more. The Millennium Falcon model even includes lasers to fire on oncoming enemies.